Need some guidance in designing your resume for design engineer jobs? View this sample to see how you can emphasize your engineering accomplishments. To be a successful candidate for engineering jobs, resume expert Kim Isaacs says it helps to have a comprehensive resume. Are you experienced in design engineering but need guidance in designing your resume? View this resume sample for a midlevel design engineer that Isaacs created below to see how you can emphasize your engineering accomplishments. You can also download the midlevel design engineer resume template in Word. And if you need more help, get a free resume evaluation from the experts at Monster's Resume Writing Service. Learn more about engineering careers and creative design careers, and search for design engineer jobs on Monster. Highly skilled design engineer experienced in researching, developing, designing and manufacturing single-use disposables, drug delivery systems, implantable devices, medical instruments and surgical devices. Qualifications include a master’s degree in biomedical engineering PE certification; expert skills in SolidWorks and Pro/ENGINEERING; and comprehensive knowledge of FDA Quality System Regulations, design control SOPs and various manufacturing processes. 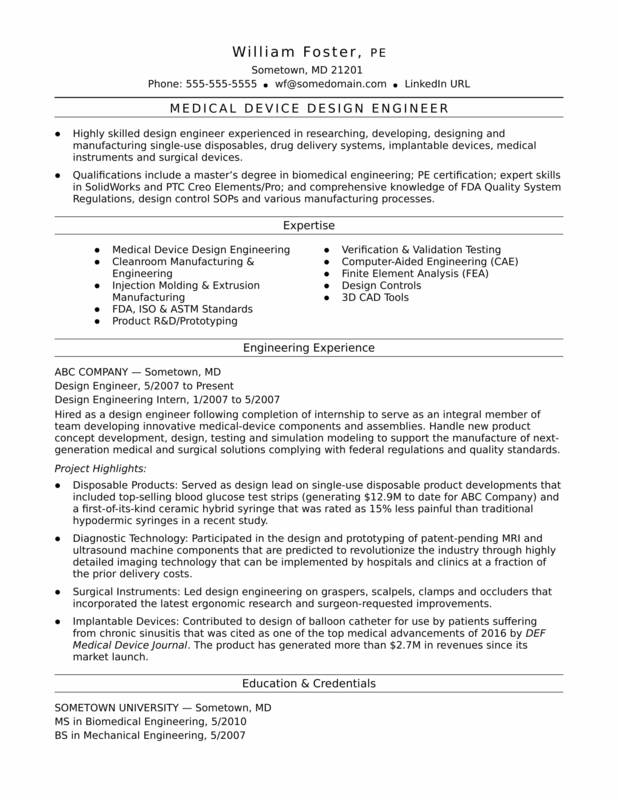 Hired as a design engineer following completion of internship to serve as an integral member of team developing innovative medical-device components and assemblies. Handle new product concept development, design, testing and simulation modeling to support the manufacture of next-generation medical and surgical solutions complying with federal regulations and quality standards. Disposable Products: Served as design lead on single-use disposable product developments that included top-selling blood glucose test strips (generating $12.9M to date for ABC Company) and a first-of-its-kind ceramic hybrid syringe that was rated as 15% less painful than traditional hypodermic syringes in a recent study. Diagnostic Technology: Participated in the design and prototyping of patent-pending MRI and ultrasound machine components that are predicted to revolutionize the industry through highly detailed imaging technology that can be implemented by hospitals and clinics at a fraction of the prior delivery costs. Surgical Instruments: Led design engineering on graspers, scalpels, clamps and occluders that incorporated the latest ergonomic research and surgeon-requested improvements. Implantable Devices: Contributed to design of balloon catheter for use by patients suffering from chronic sinusitis that was cited as one of the top medical advancements of 2010 by DEF Medical Device Journal. The product has generated more than $1.7M in revenues since its market launch.